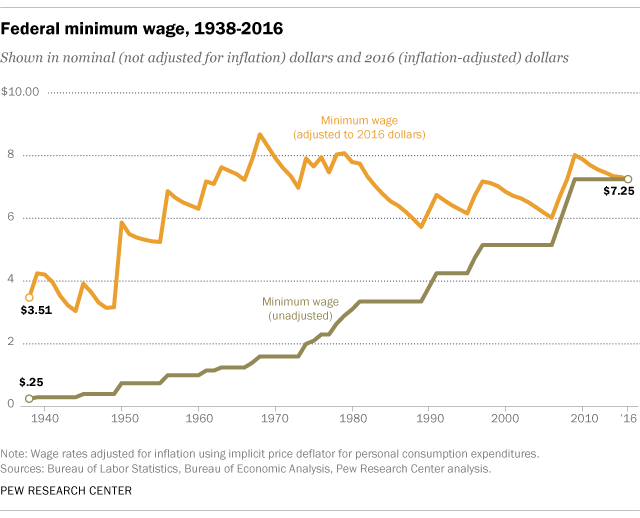 I like this nice little Pew FactTank on the minimum wage. Yes, the minimum wage needs to go up, but this certainly gives pause at thinking going to $15 is a good idea. The highest it’s ever been is $8.68 in 2016 dollars. Raising the minimum wage is not the disaster for hiring that conservatives like to pretend it is; the evidence is for fairly minimal effects. That said, we’ve never seen a minimum wage hike remotely like the $15 proposal. $10 strikes me as a far more reasonable start. But, hey, maybe focusing on $15 is the way to get there. That said, the minimum wage is an easy-to-understand economic policy, but it terms of helping out the working poor, there’s far more effective and efficient policies. Will corruption be the downfall of the Republican Party– again? Some corruption is so brazen that it immediately offends the public conscience. Republicans learned this Tuesday when their attempt to kick off the Trump era by gutting the Office of Congressional Ethics backfired spectacularly. The OCE is roughly analogous to an inspector general’s office for the House of Representatives, so the motive for defanging it is plain: It would make getting away with unethical behavior much easier. When reporters broke word of the gambit Monday evening, after a private meeting of House Republicans, the public backlash was swift. Congressional offices were inundated with constituent calls. Trump, feeling the heat, suggested they back off. And by the next afternoon, they had fully retreated. But even less conspicuous corruption has a way of seeping into the realm of substantive governing, and incurring indirect political costs. It is widely believed that the Iraq war, Hurricane Katrina, and the bursting of the housing bubble drove the collapse of the Bush GOP. This is completely true, but also glosses over the extent to which cronyism and corruption contributed in well-documented ways to each of those fiascos. They were not ex machina crises. They all stemmed from a GOP political culture that is far more tolerant of corruption than national Democrats have been in the modern era. There is no reason to believe that the Trump-led GOP can satisfy a skeptical public with prosperity and good policies that mask self-enrichment, and when Republicans fail to deliver, corruption will become a symbol of their failure. It will be their undoing. Actually, sounds about right to me. There will, inevitably, be failures. There does not have to be corruption. But, it is crystal clear that Trump is shamelessly corrupt and, so far, Republicans in Congress don’t give the slightest damn. So, yes, there will be corruption. And when there are failures and you can tie them to corruption (a connection the media will be happy to make, even when actually tenuous), then you have a toxic stew. Do I want a government rife with corruption? Hell, no. But I’m pretty sure we’re going to get one. So, I certainly do hope that helps demonstrate modern Republicans for the frauds that they are and give them the electoral comeuppance they richly deserve.